Unley Museum has won the Museums and Galleries National Award (MAGNA) for Best Permanent Exhibition for the second year in a row. The annual awards, run by Museum Australia, recognise achievements within the museum and arts sector throughout the country. Unley Museum was chosen to receive the award for its interactive exhibition Terrible Tales of Unley from a strong shortlist of national competitors. Unley Museum Curator Karen Paris said the Unley Museum team was thrilled to be acknowledged for the exhibition that explores City of Unley’s dark secrets, mysteries and strange occurrences. “These awards are highly competitive with judging panels made up of nationally recognised leaders in the sector so we are absolutely thrilled to have walked away with this award,” Ms Paris said. One part of the exhibition explores the unsolved murder of a boot factory worker in 1926 and encourages museum visitors to try to solve the crime based on evidence and a detective’s report. Unley Museum, which is housed in Unley’s former fire station building, won the same award last year for its exhibition Unley: 200 Years of Change. The exhibition traced two centuries of change from the original inhabitants, the Kaurna People, to Unley today. The MAGNA awards were established in 2011 by Museums Australia to celebrate and reward excellence in museum practice across the cultural heritage sector, highlighting the success of Australia’s museums, galleries and cultural organisations from small volunteer-run associations to the largest state and national institutions. To see the Terrible Tales of Unley exhibition, visit Unley Museum at 80 Edmund Avenue Monday to Wednesday from 10am-4pm. Entry is free. 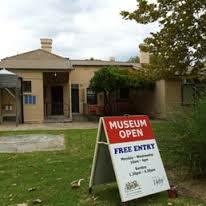 For more information about Unley Museum and the Terrible Tales exhibition, please visit unley.sa.gov.au.